If you’ve been making it to your regular dental visits, congratulations! You’re doing your part to stay committed to your long-term oral health. But it’s worth keeping in mind that dental visits aren’t just a time to sit back and relax as the dentist cleans and polishes your teeth. It’s also an opportunity to get information straight from a reliable source when it comes to dental care. The next time you visit, take a moment to learn about five questions that just might change the way you think about oral health. Having healthy teeth is crucial to performing many daily functions. However, you can’t let your gum health go by the wayside either. The gums are responsible for holding teeth in place in tandem with the alveolar bone, which surrounds the tooth root. Healthy teeth don’t have much merit if unhealthy gums can’t keep them held in place. By asking the dentist about your gum health, you can confirm important facts, such as your current pocket depths and bleeding, which are direct indicators for gum disease. While most of us don’t ask to be graded on our actions, asking the dentist about your at-home care is crucial to maintain good oral health in between visits. Not only is it a chance to learn if what you’re currently doing is enough, you’ll get to learn the best techniques from someone who’s a professional on the subject! Regardless, chances are if you’re visiting the dentist regularly, you probably don’t have much to worry about. As long as you’re brushing twice a day for at least two minutes with fluoridated toothpaste, flossing daily, drinking enough water and eating foods that promote good oral health, you’re probably fine. Most dental benefits go unused, according to a study conducted by the American Dental Association. Therefore, it’s very important that you know what benefits you have left and schedule time with the dentist to make use of them. 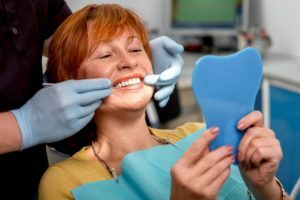 Many dental plans cover a majority of the cost for preventive treatments, so start with these and go from there. Oral health is more than brushing, flossing and visiting the dentist. It’s also about drinking enough water, eating a balanced diet, and reducing your sugar intake and exposure. Discuss your diet with the dentist to ensure there’s nothing else you could be doing based on your current risk to dental disease. Many people don’t think to tell their general practitioner how their dental visit went. However, dentists are capable of catching markers for systemic disease because many of them first appear in the mouth. For example, sign of malnutrition, blood disorders, acid reflux, untreated diabetes, eating disorders and even autoimmune diseases can all be noticed during your dental visit. Got a question we didn’t cover? Schedule an appointment today! Dr. Travis Cochell earned his DMD degree from OSHU of Portland. Along with honing his skills to provide the best dental care possible, Dr. Cochell is more than happy to answer any questions you may have. He loves having patients who want to stay informed! To learn more about his practice, you can contact him through his website.